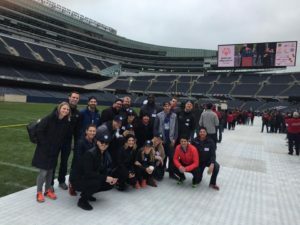 The Special Olympics Spring Games opened at Soldier Field last weekend, and UpRight’s Managing Partner, Kevin Chern, was there to help, as part of the team from the Chicago Leadership Alliance (CLA). Kevin is a member of the CLA, and UpRight CEO Ed Scanlan serves on the organization’s advisory council. We’re always happy to have the opportunity to support great causes, locally and globally. The Special Olympics offers year-round athletic training and competition for more than 1 million children and adults with intellectual disabilities in 150 countries. Special Olympics Chicago serves more than 5,000 athletes, providing training and competition in 22 sports. This organization has come a long way since the first International Special Olympics took place at Soldier Field in 1968, and we’re proud to play a small part in the great work they’re doing.